If you want to be close to the Austin Convention Center (with a balcony view of the facility), diagnosis the Grand Austin Hotel is the closest condo you will find in Austin, seek Texas. Designed and developed for large groups who wish to stay in one location, this two-level loft suite provides ample space for your favorite set of friends. The Grand Austin Hotel features 3 bedrooms and 2 bathrooms. There are four queen beds and some air mattresses, just in case you need them. Since the Texas heat can be so stifling at times, a central air conditioning unit and less often used heater both come in handy. In addition, a full-sized stackable washer and dryer is available for your use. 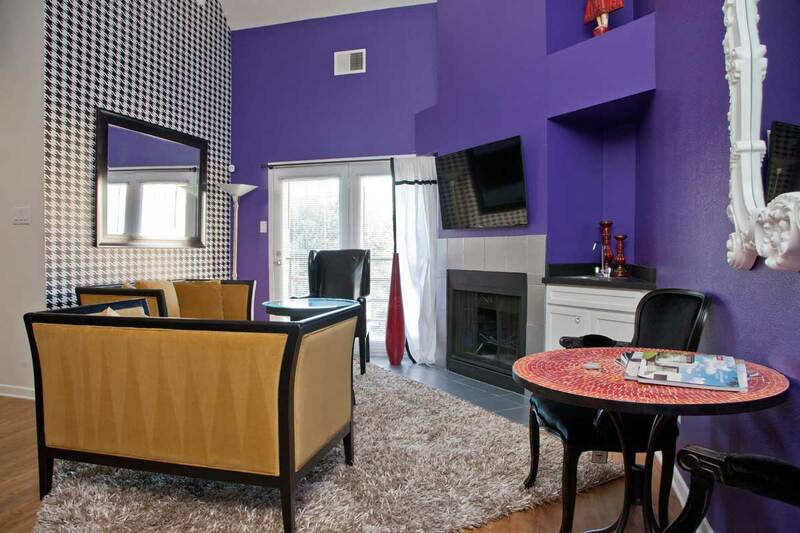 Add free cable television, free wireless internet access, free parking for one car, a wood burning fireplace, and funky furnishings that help transform your stay into an experience, and you are ready to tackle Austin like a pro. This place is awesome! In person, it looks just as amazing as the photos. There were 7 of us and the place never felt too crowded. The location is perfect and within easy walking distance of so many great bars and restaurants. Ryan is so easy to work with which made the experience even better. He sent us a ton of information and recommendations prior to our stay which was extremely helpful. He was responsive, flexible, and welcoming. My friends and I had a great time and highly recommend this place! Communication was fast and responsive. Instructions were detailed and informative. Any issues that arose during the stay were addressed promptly by Ryan and his team. Great place in a great location. Everything was nice and great for a bachelorette party. Ryan was an awesome host and the location was PERFECT! We stayed here for a bachelor party and being so close to 6th St and Rainey St bar scene was so convenient! I would definitely recommend this place to anyone! We had a really good stay at Ryan’s place. It was four of us and the size or the place was great. Very spacious with enough room for more people if needed. The location was perfect and once we got into town we could walk everywhere we needed. The Starbucks was perfectly located across the street! Will definitely stay here again when we are in town. I hosted a bachelor party for 10 guys and we had a great time. The place is clean with plenty of room. The condo has a great location. Everything we did was walking distance so we didn’t have to deal with cabs every day. Ryan was very accommodating and helpful. I would definitely rent from him again. This condo was awesome! Easily slept 8 people and was in the heart of downtown Austin. Made for a quick walk to E. 6th and Rainey St for nightlife and had tons of restaurant options all around. Ryan was very responsive and made the entire transaction go smoothly. Would definitely rent this place again. I was coming to Austin for the first time for work and decided to arrive early over the weekend. The location of this apartment is great, just two blocks from 6th street and in a busy part of the street too. The place was roomy and slept 4 guys easily and was perfect for what we wanted. We recently stayed at The Grand for a Bachelorette weekend in Austin. The place easily slept 8 girls and was in a perfect location to walk to everything! Ryan and his team were great to work with starting with making the reservation. Every question was answered promptly before and during our stay. The house was perfect for our needs: Ample space, great amenities, and all impeccably maintained. The location was perfect, right in the heart Austin with all the great restaurants within walking distance. Our group is very detailed with high expectations, all were met and exceeded. Would definitely be back. We had a great time here. The location was very convenient and the listing was very accurate. The host was very responsive to our requests/needs. Great location downtown. Most everything is walkable, Zipcars are parked a couple of blocks away for those that are not. Unit was extremely clean and worked well for 2 couples and 2 adult siblings. Airport Flyer Bus 100 brings you to/from the airport across the street. We had a great time in Austin. The location for the convention centre is perfect, a great space and the secure parking is a real bonus. We loved our stay in Austin at Ryan’s place! We could not have asked for a better location for NYE 2015 which was near a lot of the great restaurants and bars that Austin has to offer. You will not have a problem finding a place to eat or drink within 2 miles of this place and most spots you could walk to. The included parking spot was a nice treat since most hotels these days charge $20-40/night to park downtown. The actual unit was great too with enough bedrooms for the two couples we had, a great kitchen and there was free cable TV and internet. When we arrived, the unit was very clean and spacious. We would definitely stay here again. This was the second time me and my sales team stayed in this condo. It is exactly as described and expected. 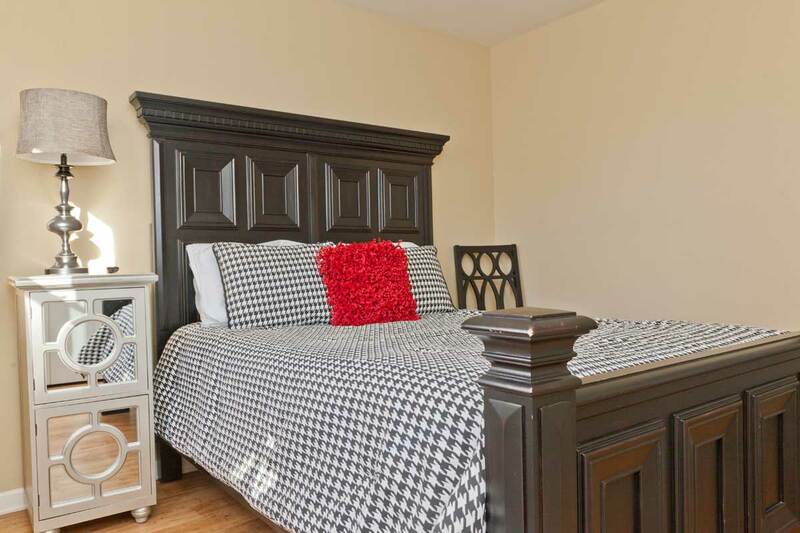 The furnishings are nice and fun–they put you in a good state of mind! I like that the place is flexible–there are 4 queens so it will work for 4 – 8 really easily and the living room furniture is good for our team meeting. What’s best about this place is it is directly across the street from the convention center, a parking space, coffee & great food everywhere around you. Keyless entry is good for a group coming and going at different times–takes the stress of losing keys off my mind. Perfect for business! Make note of the spiral staircase; I haven’t slept upstairs but you need to be nimble especially with luggage on the stairway! And, thee is no bath upstairs. Thanks for hosting us again Ryan! Hope to see you next year. Ryan and Thomas were great to deal with. I stayed at the Grand Austin while attending a conference. It was so convenient that the convention center was right across the street . It was also great to be within walking distance to many great restaurants and bars. The Grand Austin was an amazing place to stay and I look forward to staying again in the future. First off the place is great, funky and fun. Even as great as the place is, the service is world class. These guys are serious about you having fun on your stay. We needed a cooler and almost as a joke, I asked if they had one we could borrow. Within 30 minutes it was there. I travel a lot and have never seen this kind of service. As a business owner I love seeing people take pride in what they do. Thank you! I stayed at The Grand Austin and had a ball! The place is so conveniently located that you can’t help but enjoy your vacation. Ryan and Thomas are super hosts … very available for any questions or recommendations. It’s obvious that they take their customers seriously and want to provide the best possible experience for them. The Grand is decorated so beautifully – I loved the purple walls and golden love seats – I felt very special and pampered the whole time. Anyone who wants to visit Austin will be missing out if they don’t stay at one of the Onyx Hotels properties! Very nice apartment and lots of beds available for our large group. Location was amazing. So close to lots of bars and restaurants. Would definitely stay here again. Great spot! Great location! Highly recommend. My girlfriends and I loved this place!!! It was so cute and close to everything we needed for our night out. We absolutely loved our stay here! The location could not have been better, the beds were incredibly comfy and Ryan was always quick to respond if we needed anything. Would definitely recommend! The location is absolutely perfect. We comfortably fit 8 girls and the hosts were great. Thanks for a fun weekend! Had an awesome weekend in Austin and a lot of this is due to our Airbnb stay. Ryan was a wonderful host, easy to coordinate with and very flexible. The location couldn’t be any better. 6th Street was a short walk away which meant we didn’t have to put up with any of the craziness of finding a cab at the end of the night. There were plenty of places to sleep, and a big living room for us all to hang out in. We’ll be doing our best to stay here again next time we’re up in Austin. Great location. Great great location. We walked to 6th Street and/or Rainey everyday. Tons of action around this location. The unit was nice. Slept 8 (in pairs) comfortably. If you want 9 or 10 you’ll need to use the air mattress. Host was very responsive. 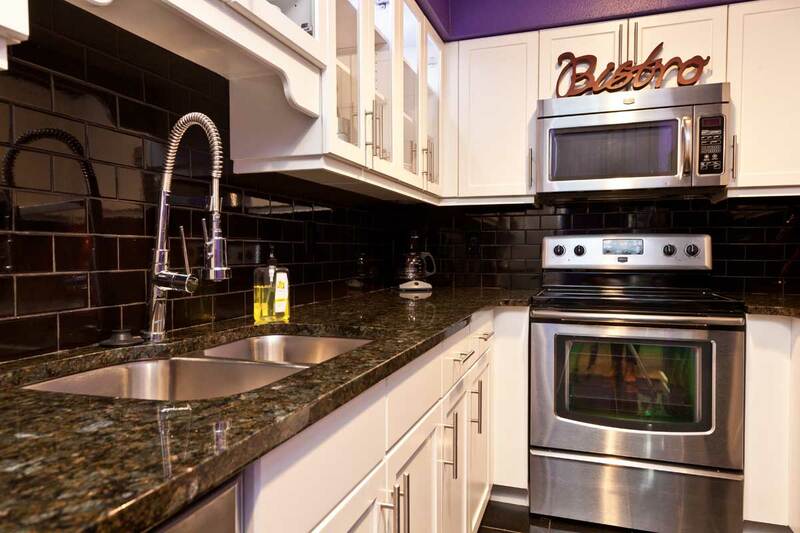 Perfect location, amazing host, wonderful condo! Being steps away from the convention center, and pretty much at the center of all the action downtown made this location a perfect place for our stay! Very pleased with the condo as it was very clean and suited our family of 6 just perfectly! Ryan made me feel right at home by giving me all the info I needed and being available with questions. We will definitely be back and would absolutely stay with Ryan again. This was a perfect experience. The place was exactly as described, clean, in a great location and check in and out was seamless. Ryan was easy to reach (though we didn’t have any questions). I would highly recommend this place to anyone looking to enjoy the beautiful city of Austin! I received a welcome email with a detailed itinerary about my reservation, which included the address, directions, code to the gate, code to the apartment, and all the amenities and services the Airbnb would provide. The pictures and descriptions were completely accurate; the apartment was spotless upon arrival and all of the appliances and furniture were in excellent condition. Excellent location and very easy communication with the owner. However, the internet was so slow that it was unusable. This may have been an anomaly, but it’s worth following up with the host if you need internet for work. Ryan was an amazing host and provided us with all the information and resources we needed to have an amazing stay in Austin. The location of the condo was perfect and within walking distance go 6th, many amazing restaurants/bars and only about a mile to Rainey Street. My sister had an amazing bachelorette party in Austin – thanks Ryan!! Very accomodating host – the general manager of the property was super easy to work with in letting us get into the apt early to drop our bags off. Ryan was helpful, kind and very easy to work with. We really appreciated how he went out of his way to make us feel comfortable and happy. The space was beautiful and clean. We had a great time in Austin! Ryan was incredibly patient and prompt in responding to our requests. The location was hip and well maintained. Located nearby the conference centre, the suite was ideal. Shortly after booking I received a confirmation email from Ryan that included all the pertinent information for my trip. Truly run like a hotel. Condo was as advertised and clean. Great location! In walking distance to tons of restaurants and bars! Would definitely rent again when I return to Austin! We loved it! 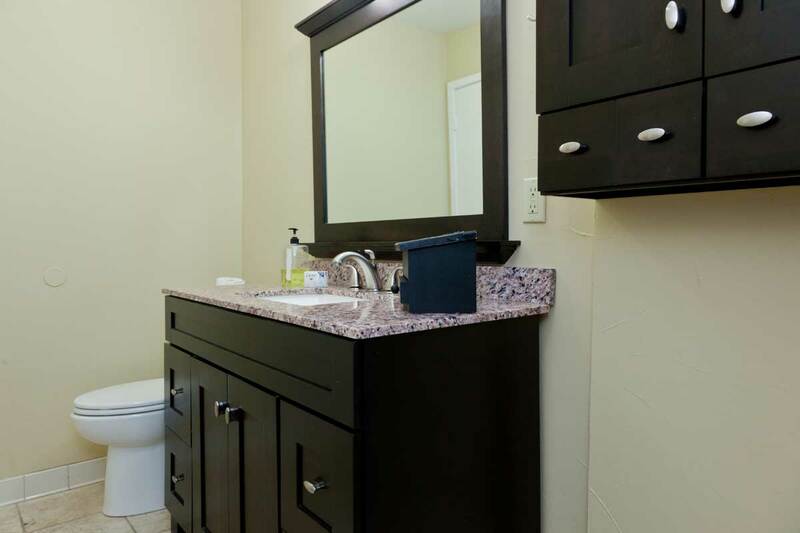 Great location two blocks from 6th street and short walk from Rainey and South Congress. We put 10 guys in there. We had guys double up in the big room upstairs and used the air mattress. It worked well with 10, would have been ideal for 8. Ryan was great. I recommend parking an extra car out front or at the courtyard. I got a parking ticket in the metered spot, but it was only $20! Much cheaper than most overnight parking I’m used to. This is a great condo! Decorated so modern and artsy. Great location downtown Austin. It was perfect for a bachelorette party! Ryan was great to work with and very informative. I highly recommend! We had a wonderful time this past weekend in Austin. The condo was perfect for our group of 8 and the location was ideal. It was a short walk to dinner and drinks on 6th street. 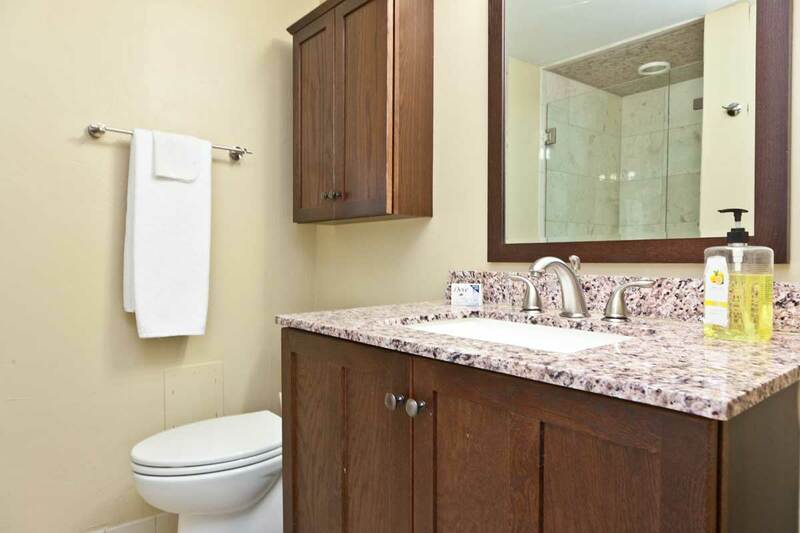 The condo was clean and exactly as described on the listing. Thanks again, Ryan! Excellent place, great location, enjoyed our stay. I would highly recommend this place!! This place was fantastic. Literally across the street from the convention center, beautifully furnished, and with plenty of space, the Grand Loft certainly lived up to its name. The only negative point was somewhat spotty wifi quality, but that’s picking nits. 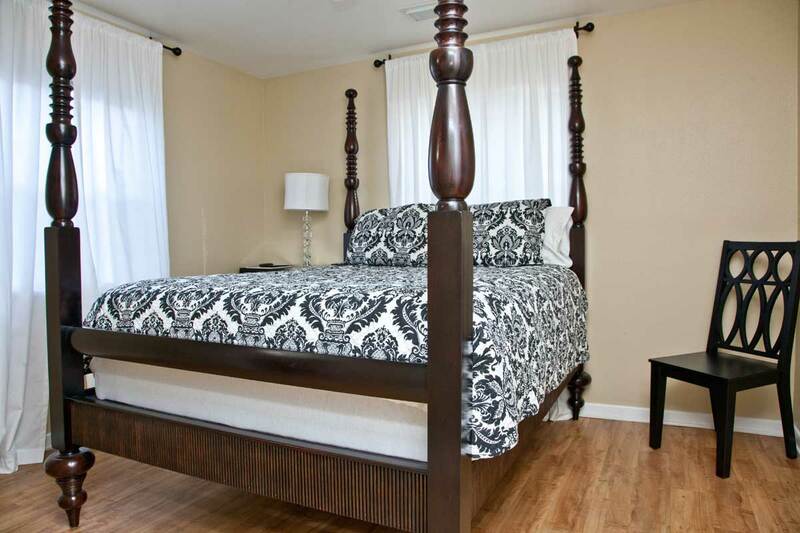 Great location, comfortable beds, perfect spot for a long weekend downtown in Austin. Easy walk to Rainey or 6th. Good communication and info beforehand, easy to get in/out with door/gate codes. We rented 4 properties from Ryan for a weekend, and they were all great. Ryan was extremely helpful and responsive, and we’d stay with him again in a minute! This was the perfect spot for my bachelorette party! The apartment is exactly as described, and the location is perfect. We had an absolute blast exploring Austin, and we were able to walk everywhere we wanted to go. Ryan and Thomas were fantastic to work with, the communication was open and easy, the instructions were clear and detailed. I would highly recommend staying here, I would do it again in a heartbeat! Thank you, Ryan ands Thomas! This was the perfect location. Myself and two co-workers were in town for a convention, and it’s literally across a very small street – easy to pop in between sessions if we wanted. It was also very convenient to restaurants and nightlife. Lots and lots of restaurants! The condo itself was nice and the small balcony was key, especially as we sat in the sun while our compatriots were getting snow back in the northeast! I do wish the bath linens weren’t as scratchy and there was some sort of recycling program – we had to leave our recyclables in the sink, hoping the cleaning staff would forward them to the appropriate location. Folks should also note that this condo is in no way accessible to the disabled, if that is a concern for you. The apartment was perfect for a girls’ getaway. 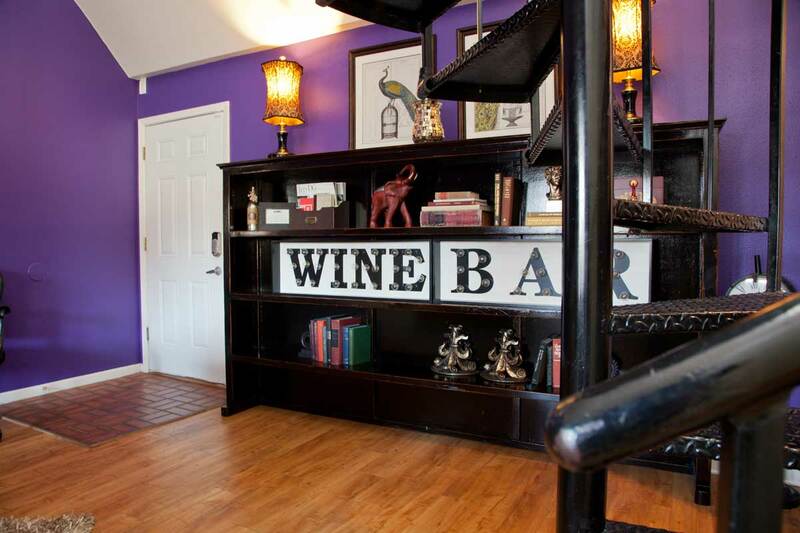 Fun décor, plenty of wine glasses, close proximity to a grocery with wine and pre-made foods, and walking distance to loads of bars. Great location and the apartment was exactly as described. Ryan was very responsive. We enjoyed our stay. Very clean and ready when we got there. Great place in a great location. Everything was nice and great for a bachelorette party. Only one incident dealing with guests being booked on the same day we were checking out and them arriving early, the cleaning crew not having arrived yet, and a food stain on one of the comforters. We payed the difference for the stain but was kind of awkward having to tell the next guests to come back later. But it happens and worth it to be able to come and go as we like with the door codes and no keys. Overall a great place! Communication was fast and responsive. Instructions were detailed and informative. Any issues that arose during the stay were addressed promptly by Ryan and his team. I rented 5 apartments from Ryan on Air BnB for a weekend in Austin (getting my MBA at UChicago and we only travel in packs); the Speakeasy, Retro Chic, Argyle, Grant Austin, and the Cosmopolitan. The apartments are well furnished and well kept. Ryan and his property manager (Thomas) are extremely accessible and helpful. All of my questions were quickly answered and it was nice that they checked in with us during the weekend, and were extremely flexible on the check in / check out times. The only thing (and this is CLEARLY written in the apartment descriptions, so its just something I should have thought about more carefully) is that it sometimes does really stink to sleep on air mattresses, so if you can at all, I’d highly recommend you only bring enough people that there are beds for. Great location downtown. Most everything is walkable, Zipcars are parked a couple of blocks away for those that are not. Unit was extremely clean and worked well for 2 couples and 2 adult siblings. Airport Flyer Bus 100 brings you to/from the airport across the street. We had a great time in Austin. 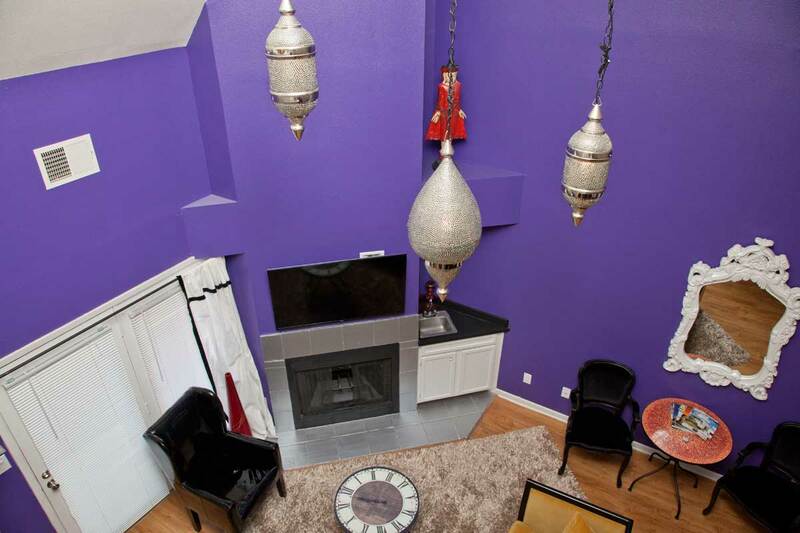 The loft is centrally located to downtown Austin. It’s close to tons of bars and restaurants on 6th street. Thomas and Ryan were very responsive and answered all of my questions quickly. The loft was a great place to spend the weekend and has a lot of charm. Great place! Perfect location for enjoying downtown Austin. Great place! Great location! Ryan was very friendly and accommodating. We will definitely plan on doing business with him on our next trip to Austin! What a wonderful trip. The property exceeded expectations from both the overall accommodations, and the level of professional service Ryan and his team extended us. They really made our trip to Austin memorable. I would highly recommend this property to anyone who’s looking for a well appointed space that’s within close proximity to Austin’s bustling nightlife. The flat is great – central, clean, comfortable. Furthermore, Ryan was a great host and reacted immediately to all our requests. We’d surely come again! We had a great time staying here. Perfect location, very comfortable and an amazing host. I would definitely recommend this place to anyone looking to stay in Austin. Our stay at the Grand Loft in downtown Austin was fantastic. We chose it because of it has four queen beds and its incredible location. You can sleep many guests and you can walk everywhere you would want to go in downtown. I highly recommend the property. Ryan operates a first rate place on Airbnb. Incredibly responsive and helpful. Added Bonus is both a Keurig machine and regular coffee pot in the apartment. We weren’t short on coffee in the morning. I highly recommend this property. Traveled to Austin with 3 co-workers and stayed in the Grand Loft for 3 nights. Everything was cleaned and well-furnished. When the Complex’s internet went down Ryan came by with a hot spot for us to use. Great location and an overall good experience. I honestly can’t say enough good things about our experience both with Ryan and with his amazing apartment in downtown Austin. From the moment we booked, Ryan was communicative, helpful and nice. When we arrived to Austin, he gave us all the instruction we needed to get in, and once we stepped inside, we were blown away. The 2-story loft is beautiful! And on top of that, he left us a basket of goodies to welcome us to Austin. Ryan stopped by to introduce himself soon after we arrived and asked if we needed anything. He was available to us the entire duration of our stay and he called me upon checking out to make sure we had a nice stay. I would HIGHLY recommend staying at Ryan’s place, you won’t be disappointed! Ryan was great to work with. He was very prompt to all questions we had and allowed us to get into the condo earlier than check-in. The condo is very nice and the pictures accurately depict it. The only flaws was that the internet only worked sporadically and the condo was dark at night since there are not many lights. In the morning we also ran out of warm water, but we did have 8 girls so that is to be expected. One thing to keep in mind is that the stairs are extremely steep and someone with a fear of heights might not like them. Overall a great experience and highly suggest. Ryan was a great host. The apartment was fantastic- super clean, hip, and convenient…we walked everywhere! Thanks, Ryan, for giving us a great experience in Austin! Great condo, Perfect location. Ryan is extremely accommodating and just a great host. Book it! I had a great experience staying here with friends! Super convenient, really close in, nicely appointed. Ryan was super accommodating and very available. The loft is lovely and we had a fabulous time! Ryan and Thomas were quick and easy to communicate with, left a very helpful and detailed e-mail with logistics, things to do, etc. and the place was exactly as described. Great experience, location and spot for a larger group. Had a great weekend in Austin! George Strait Concert along with Esther’s Follies ~~ The Grand Loft was a perfect location. Thanks so much Ryan for the hospitality with parking and information. Taxis were right across the street when needed and we were only 2 blocks from 6th street. We will be back! Ryan was a great host. Very helpful and accommodating. 6 of us stayed at the loft on 301 E4th- the space is great and right near everything. Highly recommended. Perfect location for a girl’s roadtrip to Austin. The complex felt safe and secure and was very near restaurants, great shopping, nightlife and Towne Lake. 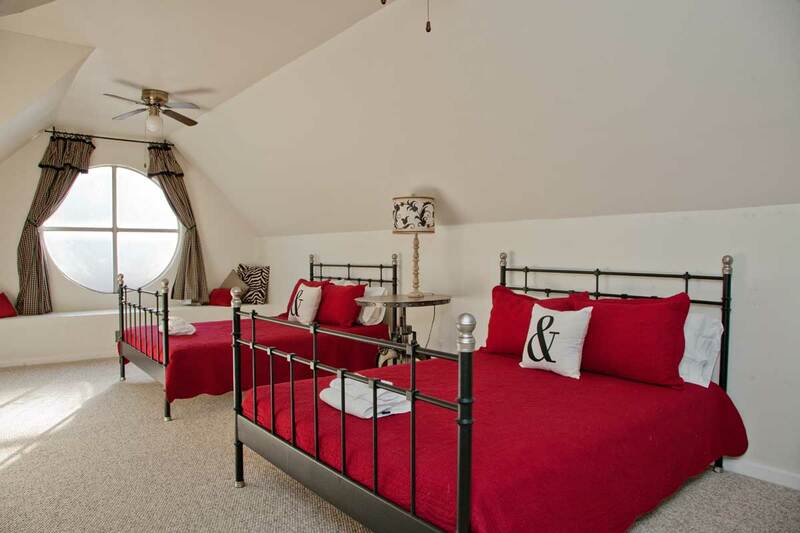 The Grand Loft was more than large enough to comfortably accommodate the 6 ladies with us. Beds were very comfortable and the sheets were so super soft! Decor was fun and fresh, enhancing the mood of the weekend. Check-In was a breeze and Ryan was responsive to our needs. We could not have asked for more and highly recommend Ryan and his Grand Loft for groups visiting Austin. We were in Austin for a weekend bachelorette party and stayed with a group of 7 in the Grand Loft. The place was perfect for us and made our trip unforgettable. On top of being a beautiful place to stay with funky decor and comfy bedding, the location could not have been better! Located next to great bars, restaurants and shops we never even left the 5-block radius around the apartment. Any time I come back to Austin, I will definitely be booking at the grand loft again. Thanks Ryan!! Condo was very convenient to everything we needed or wanted – restaurants, bars, shopping, etc., clean and comfortable. Ryan was a fantastic host. We booked at the very last minute and found the place clean and beautiful. 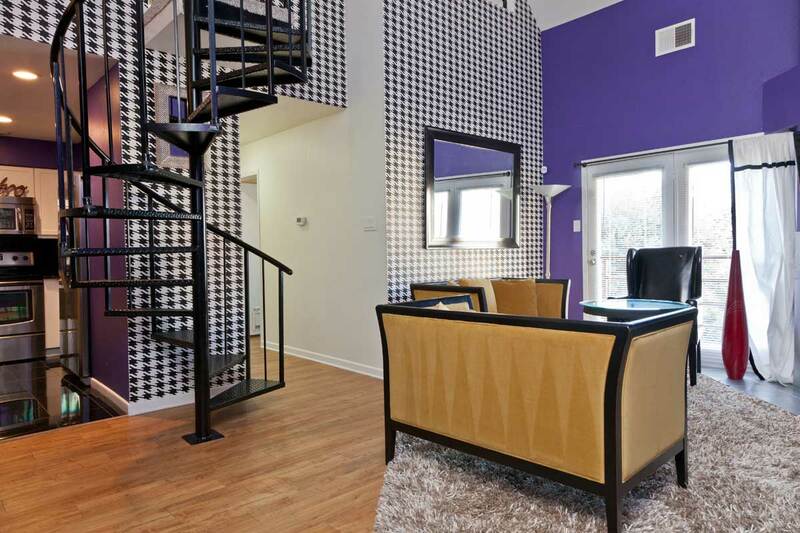 It was a funky, gorgeous apartment for a great price in the perfect location. Thanks Ryan! We had a wonderful stay in Austin. Ryan was en excellent host and even provided hairdryers, an electric iron and an ironig-board a few days before we arrived. The apartment was clean and with the two bathrooms perfect for us. 6th street and very nice restaurants were nearby. We enjoyed our stay in Ryans apartment and will be back in Austin! My friends and I had a fantastic experience with Ryan during our three day stay at the Railyard in Austin. From the moment I landed, I interacted with Ryan like he was more of a friend than a customer service representative. The condo looked great and Ryan truly made us feel at home. I highly recommend working with him and staying at one of his properties.